A significant number of patients choose not to obtain their cannabis from the pharmacy. Instead, they go to the cannabis outlets known as coffeeshops. The reason for this choice varies from patient to patient: not daring to talk to the doctor about cannabis, prefer to remain anonymous, the coffeeshop may be cheaper or offer specific cannabis varieties, or patients have a previous connection to a coffeeshop they like. However, there are clear reasons why patients may be better served with cannabis from the pharmacy. Medicinal grade cannabis offered through Dutch pharmacies is of better quality than cannabis provided by coffeeshops. This was the firm conclusion of a study performed in 2005 by the University of Leiden, published in Pharmaceutisch Weekblad, a Dutch peer-reviewed journal for health professionals. The researchers sent an under-cover person to 11 different, randomly selected, coffeeshops. This person pretended to need cannabis for a patient suffering from Multiple Sclerosis (MS), and bought a sample of the cannabis that the coffeeshop recommended for MS. 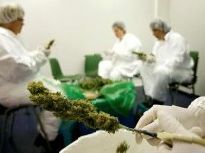 The study compared the outcome of the quality control study with the results of two varieties of medicinal cannabis that were available from pharmacies at that time. The results of the study show that the THC content (potency) of the pharmacy samples were similar to those found in the coffeeshop samples. Also the moisture contents of all samples were very similar. However, the level of contamination with bacteria and/or molds was above acceptable levels in all coffeeshop samples. In contrast, pharmacy cannabis is guaranteed to be free of such contamination because of the fact it is sterilized before distribution. What is the risk of contamination? A reasonable question is: what is the risk of microbiological contaminations? After all, bacteria and molds are everywhere, and they are not necessarily dangerous to our health. However, it should be noted that we are talking here about medicinal use! Although healthy individuals may not be affected by mild levels of contamination, medicinal cannabis is mainly used by chronically ill and therefore vulnerable individuals, such as patients suffering from cancer of HIV/AIDS. In contrast to popular belief, the heat released by smoking does not fully protect you against microbes. The spores of many kinds of mold are heat-resistant, and can be inhaled together with the smoke. And once a mold has started growing in cannabis buds, it may produce large quantities of toxic compounds that can also be inhaled. A famous example of such a toxin is aflatoxin. For exactly that reason, Dutch pharmacy cannabis is sterilized by gamma-irradiation, even though this treatment may be controversial with some patients. However, Bedrocan BV is constantly working to improve its cultivation conditions, so there is good hope that gamma-irradiation may not be needed anymore in the future. From different studies and reports in the media it is clear that microbes are not the only type of contamination found in coffeeshop cannabis. Pesticides, and the application of growth-inducing chemicals, are often used in the (illegal) large-scale cultivation of cannabis. And because cannabis is paid by weight, there have been reports that producers add materials to make their crop heavier. These materials range from sand and metal particles to much more dangerous materials such as glass and lead. In conclusion, there is no way to make absolutely sure that the quality of coffeeshop cannabis is safe enough to use it as a medicine.